As global resource extraction and use grow, resource scarcity has become an imminent threat and climate change has shown to require costly adaptation. Worldwide, 75% of firms expect to face supply risk already by 2020 (KPMG, 2012), while costs to adapt to a warmer world by 2050 may require up to USD 100 billion per year. There is also an increasing societal and regulatory pressure on companies to identify alternatives to hazardous substances as well as an increasing demand for transparency, and environmental performance beyond compliance. The performance of the specialty chemicals industry in the upcoming decades will be interlinked with how consumption, infrastructure, technology and wider society will behave and evolve. Understanding the sustainability trends and drivers shaping the landscape where chemical companies will operate is a prerequisite for grasping what performing sustainably means as is the design of the actions needed from businesses to create sustainable value. Sustainability and performance leadership require moving beyond current standards by innovating and addressing sustainability in pioneering ways. The Sustainability@Clariant Portfolio Value Program was launched in 2012 and developed in partnership with CSCP. The program’s holistic approach provides a significant driver for sustainability progress not only within the company, but also across the value chain and ultimately the chemicals sector. In order to drive sustainable innovation and the realisation of sustainable value, three aspects of essential importance were identified: firstly to anticipate, cater, and tailor to future needs and demands (INNOVATE); secondly to build sound sustainability evidence based on reliable criteria and verified assessments (ASSESS); and thirdly to engage and create solutions collaboratively with key stakeholders – both internal and external – in transparent and credible ways (INVOLVE). Assess comprised of understanding the status quo and identifying needs and innovation opportunities through benchmarking of product and portfolio sustainability tools. Involve aimed at engaging stakeholders and harnessing their diverse input and contributions for a shared vision and deployment of sustainable value creation. Implementing such a strategy fit with Clariant’s own vision to stand out for above-average lasting value creation for all of its stakeholders and the integration of sustainability as one of the strategic pillars in the company strategy. In the scoping phase the CSCP conducted background trend scoping, customer and stakeholder interviews, and internal visioning workshops . 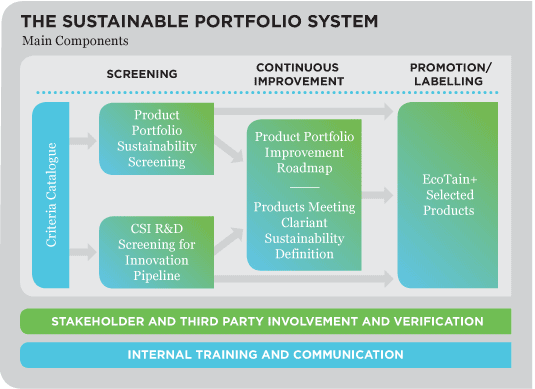 In the development phase, tools were co-developed by CSCP and Clariant including a product portfolio screening process and the EcoTain label criteria for excellence solutions. 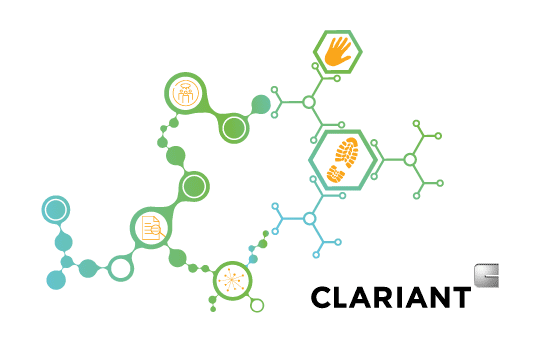 In the final phase, CSCP was involved in development and session moderation for Clariant’s stakeholder dialogue as well as a joint case-study publication to share learning with a wider base.